Treat yourself to a relaxing vacation at Seas the Bay! This gorgeous house on the bay offers the best of both worlds, bay out the back door and beach about 6 minutes away out the front door. Imagine yourself sunbathing by the pool or meditating on the backyard swing, whichever you decide to do, one thing is guaranteed – a total relaxation! Ground-Level: Queen Master with LCD TV, Shower, and Access to Screened Porch; Laundry Room. Extras: Private Pool, Wireless Internet Access, Screened Porches, Gas Grill, Backyard Swing, Boat Slip, No Smoking, PETS NOT ALLOWED, Parking: 4 Cars, Distance to the Beach: 1,300 ft. Treat yourself to a relaxing vacation at Seas the Bay! This gorgeous house on the bay offers the best of both worlds, bay out the back door and beach about 6 minutes away out the front door. Imagine yourself sunbathing by the pool or meditating on the backyard swing, whichever you decide to do, one thing is guaranteed – a total relaxation! Top-Level: Living Room with LCD TV, Deck Access with Picnic Table and Grill, Kitchen with Stainless Steel Appliances and Granite Countertops, Dining Table seats 8, Screened porch with couch and dining table, Queen Master with Shower/Tub combo and Access to Screened Porch; Bedroom with Duo Bunk; Bedroom with 2 Bunk Beds, Hall Bathroom Ground-Level: Queen Master with LCD TV, Shower, and Access to Screened Porch; Laundry Room. 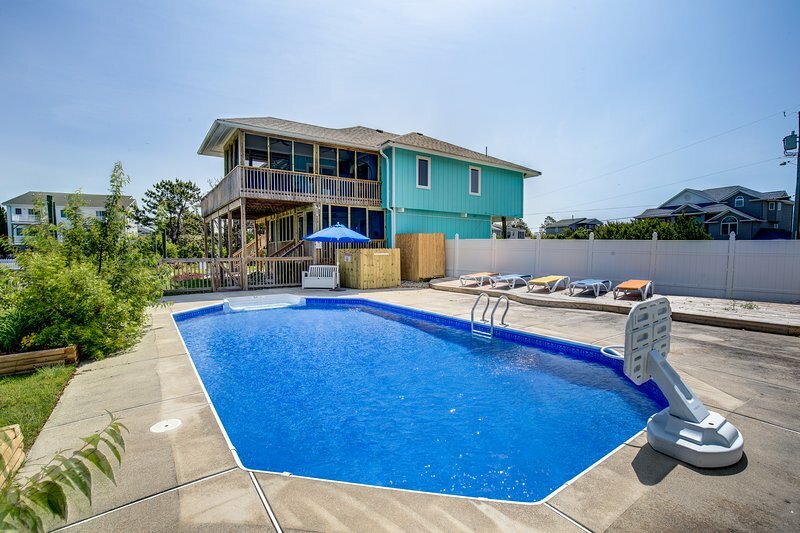 Extras: Private Pool, Wireless Internet Access, Screened Porches, Gas Grill, Backyard Swing, Boat Slip, No Smoking, PETS NOT ALLOWED, Parking: 4 Cars, Distance to the Beach: 1,300 ft. Additional amenity details: Private pools are open from May 3, 2019 until October 6, 2019. This property is not equipped for pool heat. Pool heat is not an option for this property. All Sandbridge Blue properties provide bed linens, bath towels, beds made prior to your arrival, and a starter supply of: toilet paper, bathroom soap, paper towels, and dishwater detergent.